Could a Character Based On Yourself Survive The End of the World? Roleplaying game The End of the World challenges you to survive the apocalypse as yourself, with your friends, in your hometown. Chances are that if a zombie apocalypse happened, many of us would be wholly unprepared. 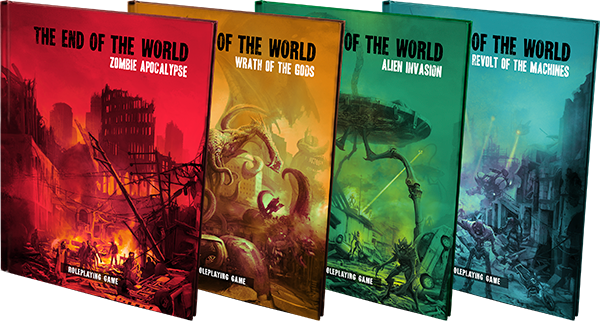 Fantasy Flight Games' roleplaying game The End of the World is a set of four different horror situations where players' characters are themselves. Many roleplaying games involve characters assuming roles such as dwarves or elves, but The End of the World uses your characteristics and skills to build a character based on yourself. Characters have the following characteristics: dexterity, vitality, logic, willpower, charisma, and empathy. Along with positive and negative detailed aspects of yourself, your character and your friends' characters will have to try to survive with the limited gear actually around you. Survival isn't about shooting zombies in the face. Players will need to deal with scavenging for food, water, and medicine and find shelter, as well as surviving physical and mental traumas. 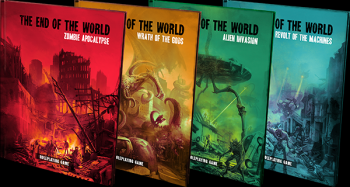 The End of the World is a set of four books -- Zombie Apocalypse, Wrath of the Gods, Alien Invasion, and Revolt of the Machines -- each with five unique scenarios inside relating to the book's theme. The Zombie Apocalypse book will release before the end of this year, and the remaining End of the World books will be released at a later date. Fantasy Flight Games promises countless struggles.